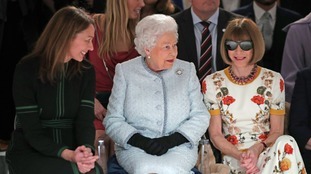 A royal expert has criticised Anna Wintour for wearing sunglasses while conversing with the Queen at London Fashion Week. Mo Farah has been officially knighted following an investiture ceremony at Buckingham Palace. 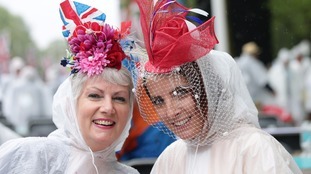 Anita Mead (left) and Lisa Kilby arrived early to the party and would not let the weather dampen their fashion. Credit: PA. Early arrivers have been making their way to the Patron's Lunch on The Mall, the final public celebration of the Queen's 90th birthday. The weather has been wet and miserable, but spirits appear to be high. Rows of plastic chairs and tables awaited the lucky ticket holders, who each paid £150 to attend. Selfies in the rain at The Mall. Credit: Press Association. Organisers apologised for the delays to get in, due to security checks. The finale of the Queen's official birthday is The Patron's Lunch street party. Members of the Royal Family have appeared on the balcony of Buckingham Palace to greet crowds gathered to celebrate the Queen's official 90th birthday. The Duchess of Cornwall, the Duchess of Cambridge and Prince Andrew were among the royals waving to crowds. The Queen is expected to appear later for an RAF fly-past. Thousands of people lined The Mall and gathered outside the palace ahead of the spectacle. The Trooping of the Colour took place earlier on Horse Guards Parade as part of the second day of celebrations. 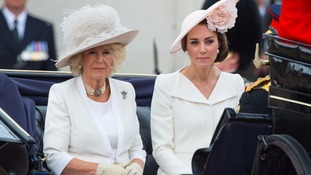 The Duchess of Cornwall and The Duchess of Cambridge leave Buckingham Palace to view the Trooping the Colour ceremony as the Queen celebrates her official birthday. The Queen's official 90th birthday is being marked at the Trooping the Colour parade in central London. Dressed in a bright lime green coat and matching hat with pink flower, the Queen waved to crowds as she left Buckingham Palace in a horse-drawn carriage, accompanied by the Duke of Edinburgh. The Queen's official birthday is set to be marked today by a Trooping the Colour parade held in her honour. The prince said his grandmother should take some time off to "lie about."